“Craig’s Energetic Perspective on Evolution.” As the title suggests it is Craig’s interpretation of evolution from a personal and scientific perspective. In it he associates the connection of his multiple visions and scientific information from the David Wilcock on-line book Divine Cosmos, to our continual evolutionary process. Suzzan asked me to convey my energetic perspective on physical and spiritual evolution. As long as I have lived, (over 50 years) I have noticed that opinions and theories on how some observable phenomenon actually operates can change. It has not been proven that the phenomenon changed, yet accepted theories on its operations can drastically differ over time. Such theories that first come to mind are the switching centers of our rotating planetary system between the sun and the earth. Since we all do not take or have the opportunity to verify firsthand many theories that we hold plausible and believable, it would mean that at some point in our understanding of the bigger picture, we merely allow someone else’s opinion to influence us. Isn’t this really what most of our personal understanding is based on throughout our life? What I have found really important in my life dynamics is that I at least pay attention to the moment and do my best. In paying attention to my life (last 13 years) I found the need to make a change and experience all that was possible, firsthand. From that choice I was compelled to travel within, and that was good since I was rather tired of traveling the world. The inward journey really lends itself to firsthand. On the way I found it helpful to drop what I thought I knew about things and just enjoy the ride, so to speak, under the guidance of an internal friend. I didn’t know where I wanted to go or what I wanted to see and so I decided to put all my trust in my friend and respect the guidance given. It was very difficult at first, due to tripping over decisions that I agreed not to make, along with keeping enough faith in the evolutionary process to dispel the fear of trusting my guide. I am still on that journey being shown many things and even have two-way communication with my friend, who has proven to be completely trustworthy and my most valuable resource. I am told to always use my reason and that helps me realize the binding relationship existing between science and spirituality… what a relief. It is that realization that allows me to be objective enough to stretch my open awareness of observed phenomena. It is this improved awareness that affords me the chance to present to you my recorded visions and the synchronicity of recorded science at this time. I believe that the best I can do on any subject is to share my understanding of it externally and if the energy of my thoughts resonate with your thoughts, then an energetic exchange takes place visiting your understanding of the matter at hand. Sometimes conscious understanding on a subject seems nonexistent and comes from a knowing deep inside that is only triggered or confirmed by the thoughts expressed by another. That experience is rare like a gift handed to us by something greater and beyond everyday life. Just such an experience is what I will share with you, if that is possible. Ideas about things will eventually drive our action or inaction on a matter we do not ignore, unless we are just unconsciously reacting or possibly not paying attention and operating in rote. A common saying that seems relevant to actions is: “those that choose not to remember history are doomed to repeat it.” It seems to me that as a species, we have been operating from a place of “repeating doom” for quite some time now. That cycle of events can change and evolve to a harmonic existence with the people and things around us all. I feel the need to warn you that it does involve facing fear and paying close attention to living in the moment. Fear of the unknown is something that I believe all of us can relate to from personal experience. I believe that it is accurate to say that most of us avoid confronting fear. I’m not talking about adrenalin rush I mean real fear. It can come in large and small doses and it can be obvious or subtle. It is that large dose of obvious that we really don’t need to think about, because in most cases we just react to it. The small subtle dose is the kind that without close attention paid, can result in virtually no apparent effect, or produce disastrous results in outcome of events. Each individual’s perspective is what sets the level of fear for them and personal choices drive their reaction to such, unless reaction becomes involuntary. The kind of fear I was talking about-facing earlier is in the personal choice category unless we are not paying attention and then it may fall into involuntary status by default of wanting to stay in our established comfort zone. Let me say now, I believe that just our mere continued existence requires that we all pay attention and break this repeating cycle of doom that humanity lives with. There is enough observable evidence around us to suggest strongly that this cycle can and should be broken by overcoming our fear and making the personal choices open to us. If you don’t feel this pertains to you, I suggest you have not been paying attention to your subtle internal gnawing that will do nothing but get stronger until you address it by a choice of some kind. Oh by the way, the friend that guided me on my journey was called God. Not the same God I had been introduced to as a child, even though they have the same name; this God is more like an indescribable interface to the plethora of mysteries self-consciousness holds for us. The reason I go back to that is because of the “interface” aspect described, which sets up a perspective to the kind of data, I believe that my visions or lucid dreams (all experienced in a non-sleeping state) are showing me and hopefully you by the end of this appendix. Please let me digress for a moment to relate an experience I encountered around 30 years ago while at sea. I had been dabbling in art most of my life to that point and my medium of expression at that time was quill pen and ink, and paper in a pointillist (one point at a time) style. I wanted to experiment with becoming a receiver from somewhere outside my head, to hand then to paper. In other words, I wanted to be used as the interface from somewhere unknown to the paper in front of me, as in the operational manner of a telegraph (dots and dashes) means of wire communication, only without the wire. The result was the hand graphics drawing that you see on the front of LOVE THE COMMON DENOMINATOR MY JOURNEY TO THE TRUTH. My life has been quite exciting, or so many people tell me and yet as I look at war, hunger, greed, and just every day life around me; there poking through the disguise of time stand nomads. I am not the only receiver out here and that internal gnaw is probably the conflict of our auto-tune circuitry trying to lock on to the transmission that we are manually overriding. We are not only of this time. We need to be more than nomads passing through this time and space just surviving for the familiar insanity our fathers before us have showed us. We are here to aid our symbiotic partners (our body and species) and our true spiritual essence in this upcoming evolutionary jump that is looming in the future not so distant. Most if not all of us, have ideas as to the makeup of our life in respect to the world around us from a perspective of something we already understand. For example, having been a field engineer for missile systems and involved in multiple aspects of computer-aided information technology (35 years), I have a solid understanding of microwave and electronic theory, and systems operations. There is a saying that speaks of learning at least one job in life completely, for then that knowledge can be used as the basis for understanding most things in life. I experienced the visions years before I ever looked at the website. The data on the site was a gift of synchronicity confirming the spiritual nature of unfettered science; the key piece in explaining my visions and demonstrating that individual human interaction plays a critical part in evolution and thus substantiating the sanity of my last 13 years. We are all here at this time with the knowledge needed to complete our task at hand. Intrinsic knowing gets triggered at the appropriate time and each of us that have chosen to come here now, will either go with it or not. I will present you with my understanding of this by firstly giving you the setting for my vision and then transition into the excerpt (italicized print) proceeded by its SECTION HEADING, next my comments (not in italics) followed by associated web data (-10-font- referenced by section numbers) and lastly my comments again (not in 10-font) so you can see that connection. The data I quoted from David Wilcock’s website, I left formatted in its original style and order to give you a cohesive glimpse of what the site represents and also clearly set it apart from my own writing. Because I kept the sites data in chronological order the visions have been moved out of their original sequential order as may be noticed by their dates. It was the spring of 1998 and after coming out of the Middle East in 94, writing our first book My Lost Love,4 almost loosing the house due to finances, and then finally landing a steady job in December of 96 with Boeing, both Suzzan and I were on a well deserved cruise to Mexico. On that cruise is where we crossed paths with John and had the conversation about my failed initiation attempt at the Great Pyramid. Nothing much more was said about it after that evening on the ship and over 2 years past and then we were guided to Palenque Mexico in the Yucatan Peninsula. It is the ancient Mayan site where the pyramid Temple of Inscriptions housed the burial place for Lord Pacal with his tombstone, the Amazing Lid of Palenque. The lid not only provides sunspot cycle information, but acts as a sub-transformer pictograph that displays ancient Mayan myths. The entire site is quite large to walk around and very pleasing to the eye. Suzzan and I were sent there with a friend to close out the old age of blood sacrifice, honor the Twenty-Sun-Day-Gods, and usher in the new age. Other missions were accomplished there, but the important thing to understand is how the vision of my initiation and death set my intent forever residing in the resonant energy pattern required for me becoming a more open receiver by confirming my understandings of reincarnation. This confirmation was the catalyst allowing me proper action making energy connection and interaction productive; the actual bedrock of my faith needed to continue moving forward in the unknown space of energetic evolution. After telling Craig and Suzzan that he was the reincarnation of the Buddha, John related that he had memories of the Great Pyramid. He then asked mysteriously, “Do you know of another incarnation I had?” Suzzan’s mind immediately flashed on Tutankhamen and so did Craig’s although neither of them voiced their thoughts. Even so, when they did not answer him, John confirmed their intuition by telling the couple that he had been that very king not two minutes later. This revelation reminded Craig of an incident he experienced several years earlier. While on contract in Egypt in the early 80’s he had taken the opportunity to visit the Great Pyramid on the Giza plateau. However, at the entrance Craig had been unable to enter the pyramid due to an inexplicable feeling of tremendous self-suffocating fear. He could not make himself go in. Surprisingly Craig had dismissed the episode with barely a thought, even though he was not a fearful person, he did not question his inability to get past the feeling of suffocating fear. The day had been unusually eventful with joy of sleep a gripping reality, and even though Craig was quietly waking from its familiar clutches, he knew this dream-state realm was merely opening the curtains for the play to commence. The birds were chirping, dawn was coming and the humid quiet of the jungle felt magical. The surroundings were different but the scenario was familiar, he dare not fully acknowledge break of slumber least this moment pass him as an unwilling participant. “That was it,” Craig thought, “That’s all I get?” Careful not to utter a sound he slipped into the water, heart pounding, and then drew in all the air his lungs could hold before diving under that sacred surface. The initiate was confused, yet certain that death awaited him if he did not find passage to whatever lay ahead. He moved away from light glimmer down the water sealed trench hands searching the ceiling for a life-giving pocket of air. It was useless. The trench seemed to be six cubits wide by eight cubits high and straight with no areas left for a second breath. Craig was a strong underwater swimmer and in a frog-like motion moved down the top portion of the trench gaining speed as his mind envisioned a terminating chamber much like the one he had entered. Confident now, heart still pounding in his chest, he relinquished all restraint as powerful strokes moved him down the watery corridor of this hellish test. In a sudden jolt all forward motion stopped and everything got calm. My God, what a glorious feeling, what a wonderful release, it was as if some floodlight had been turned on and he could see everything, even through walls. He watched from a distance as a motionless body sunk to the bottom, and at the same time could see white-robed men waiting at the waters edge in a well lit chamber. He was spirit and no longer fettered to that husk of a body. There truly was the spirit that lived after, and in fact, cognizant of his very own thoughts—to be more precise, it was Craig. The scientific statement that energy cannot be destroyed and only changes state, took on new meaning for me. It helped support my belief in the eternal nature of the spirit and appreciate the gift that was given to me in my above Palenque vision. It was fortunate timing and that gift used for my expansion of possibilities in paying attention and continuing forward with correct intent required for successful exchange. It helped me get out of the box and see from another perspective. Just the view required for proper sight in completion of the unseen procedure. Knowing the project as evolution is important; relating the process is vital for understanding the journey. The Universe and internal energies have given us signs that existence may not just be only what is experienced by our five-sense awareness. Science is once again aligning with that understanding by embracing knowledge of a substance referred to as AETHER. The world’s secret mystery schools from the time of Plato and beyond taught of such. Please see below: (CHAPTER: 01: THE BREAKTHROUGHS OF DR. N.A. KOZYREV, with all associated subsections) from the website. The aether’s existence was widely accepted without question in scientific circles until the early 20th century, when the Michelson-Morley experiment of 1887 was co-opted to “prove” that no such hidden energy source existed. However, more recent breakthroughs involving “dark matter,” “dark energy”, “virtual particles”, “vaccum flux” and “zero-point energy,” to name a few, have brought reluctant Western scientists to acknowledge that there must indeed be an unseen energy medium throughout the Universe. As long as you use a benign term like the “quantum medium” and not the forbidden word ‘aether,’ you can talk about it in the mainstream press without much fear of ridicule. The mainstream scientific establishment is very heavily polarized against anyone who gets too close to an ‘aether’ theory, as they “know” that such a theory must be false and will therefore fight vigorously against it. However, such suppression only increases the desire and commitment that many others have put into solving the puzzle. One early example of proof for the existence of the aether comes from Dr. Hal Puthoff, a respected scientist from Cambridge University. Puthoff frequently mentions experiments from the early 20th century that were designed to see if there was any energy in “empty space,” conducted before quantum mechanics theory ever existed. In order to test this idea in the laboratory, it was necessary to create an area that was completely free of air (a vacuum,) and lead-shielded from all known electromagnetic radiation fields by using what is known as a Faraday cage. This airless vacuum space was then cooled down to absolute zero or -273° C, the temperature where all matter should stop vibrating and thus produce no heat. The amount of zero-point energy in the space volume of a single light bulb is powerful enough to bring all the world’s oceans to the boiling point! Research conducted by Nikola Tesla led to his statement in 1891 that the aether “behaves as a fluid to solid bodies, and as a solid to light and heat,” and that under “sufficiently high voltage and frequency,” it could be accessed – which was his hint that free energy and anti-gravity technologies were possible. Let us pay special attention, again, to Tesla’s statement that the aether has a fluidlike effect when we are dealing with solid objects, as this ties in directly with the work of Dr. N.A. Kozyrev. To date, world periodicals reference to torsion fields amount to the order of 10,000 articles, belonging to about a hundred authors. Over one half of those theorists work in Russia alone. The graph shows that somehow, a change in the mass consciousness of humanity affected the behavior of electromagnetic energy in computer circuits around the world, especially those computers nearest to North America. Later we shall see that this is just the beginning of a whole new world of “consciousness science.” We will suggest that torsion waves and consciousness are essentially identical manifestations of intelligent energy. Scientific evidence that invisible conscious aether is the energy substance that forms all physical matter has been known since the 1950’s and now only coming to light on a large scale. Simply using a term like “consciousness science” seems like a welcomed sign of more good things to come from the scientific community. The scientific explanations given in chapter 01 and those to follow can serve to explain how a conscious energy substance known as aether, which links the universe and our existence in a single way that may explain an intelligent oneness design that I refer to as God (just the name I use). The conscious nature of aether suggests the possibility of physical interaction with just such a permeable substance. I am not trying to give you mystical religion, but rather remove the mystery of life and justify giving consideration of thought that may lead to right action for possibility of some sanity in our continued existence. We can no longer continue to make no changes to our formula for living and expect a change in outcome, or become sane (so to speak). Please see below: (CHAPTER: 02: LIGHT ON QUANTUM PHYSICS, with all associated subsections) from the website. Dr. Kozyrev’s experiments give us a radically different view of matter, and its interaction and connection with the surrounding environment, than that which is taught in the scientific mainstream. Therefore, a new model of quantum mechanics is required to account for matter being able to subtly increase and decrease in its weight, based on its interaction with a non-electromagnetic, fluidlike energy source. The more esoteric questions related to how torsion fields connect with consciousness and spirituality shall be relegated to later chapters; at this point, our main concern is to establish a working system of physics that explains exactly what matter is. If nothing else, Kozyrev’s findings show us that we still do not have an adequate model to answer that question. …Thus, as “particles” move through the aether, their central axis of spin is aligned with the direction of their motion. This gives them the exact same “vortex” quality of movement as we would see with a smoke ring – this formation is automatically created by any straight-line movement through a fluid medium. Our next question is exactly what this spherical vortex will look like. Let us begin by visualizing what happens when we have a single fluid that rotates around a central area. Once the fluid begins rotating, it forms a whirlpool along its rotational axis. This can be demonstrated very simply by filling up a sink with water and then stirring up the water with our hand in a large circle. We will quickly form a whirlpool in the center of the circle. Now, we need to imagine that same fluid rotating inside of a spherical area, in this case the outside of the atom. What we will discover is that a whirlpool will again form along the rotational axis, between the north and south poles of the sphere. This whirlpool forms a complete hole through the center of the sphere. On one pole of the sphere, the water will flow in, with the vortex becoming progressively narrower as it approaches the center, and then the continuing momentum of the water will cause it to flow out through the opposite pole, the vortex becoming progressively wider as it reaches the outer edge. The water must flow in one side and out the other, since it has nowhere else to go. This is a basic property of “torus” formations and can be seen in the inwardly-curling movement of smoke rings, for example. 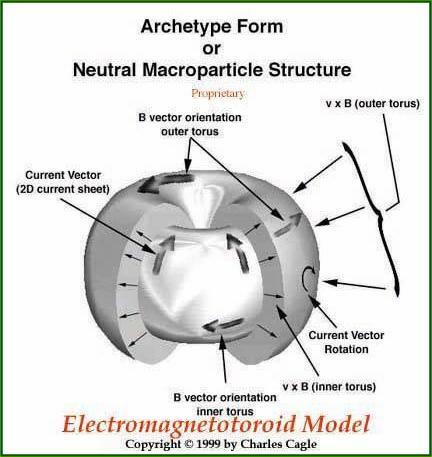 Naturally, a picture is worth a thousand words, and the Figure (below) from Charles Cagle shows the structure of the spherical torus at the quantum level, which he calls the “electromagnetotoroid”. [I asked Mr. Cagle for permission to use the above drawing and here are instructions from the Email: “I'm hesitant to allow use of this drawing because it is actually misleading... If you use it and say that there is no true outer B or H surface...and indicate that I said this, then you can use it.”] I LOVE THE VISUAL AFFECT…Thank you Mr. Cagle! The concept of the “magnetron” model of the atom and that “particles” of matter are solid, are no longer accepted theory in many scientific circles. The “particles” behave more like waves. Understanding of details in such theory is not nearly as important as the implication put forward that atoms are not actually “real” and to use them as the foundations of matter is nothing more than an unworkable assumption. Couple that with the conscious nature of aether that science tells us forms all matter and I believe that all of us have pause for thought into just how life evolves and our individual energetic part in it. It is only just now (last few days) that I have finally been given the big picture necessary for relative understanding of the past events. It may seem like a long time to wait, and it would be had I been waiting. I have not; the parameters had not met to facilitate the aetheric exchange to myself from the aether around me until the last few days. That sounds so appropriate to say in that way. In the information above in chapter 02; it talked about fluidic aether would rotate around the outside of the atom’s central axis and in one pole (north) and out the other pole (south); there was just no place else for it to go. With that flow established between the poles a stream of (intelligent) energy is created in the surrounding aether that can move from one place to the other. In other words when I was ready to receive the information of the big picture, God (just the name I like) used the aether to communicate to me without words. Not as far fetched, as it used to sound is it? I will be going into the communication thing again later, now lets get to the vision. As Craig lay on the bed to retire for the evening, events of other trips streamed through his mind. This quest was not much different in the mechanics of getting from point-A to point-B than other trips. The usual last minute schedule changes and the appearance those connections may not be made had already manifested themselves. No, the feel was different, the vague clarity of purpose didn’t seem to be present and very little else seemed to be piecing together. On the other trips visions or instructions usually let the couple know what to expect, yet even with all that going on, Craig experienced a knowing calm that something was about to break loose. The accommodations were comfortable, the bed was a king-size and Craig could remember just reaching out to keep a finger on Suzzan for some unknown reason; nevertheless, this pose was continued throughout the vision that was to follow. Things happened that he could not quite remember, but it was the feeling of moving away from something that stuck in Craig’s mind, even though the details were not that clear, the memory was. There was a void and suddenly he could see a floating object off in the distance, in his rapid approach this object soon turned into a matrix. He could feel his presence inside this huge geometric arena with a cubical grid as the viewing area. The viewing area kept changing from gridded lines to gridded dots, to both lines and dots and sometimes just a single plane. The viewing area switched to gridded lines and held as though some performance was about to begin. Craig felt as if poised at the top row of seats in some gigantic non-physical stadium and something was telepathically reciting the program’s agenda as different events took place. Somehow he was linked to a red field of energy within the matrix that was taking different shapes in the viewing area—the shape it took was directly tied to Craig’s thoughts. He was being shown by some unseen presence how to control this energy movement and be in more than one place at a time. Move straight up was the thought, and the red energy spiked up surrounding a single vertical line, spread out throughout all the levels now occupied in a cylindrical shape, and it did so. Occupy one level and spread out; the shape of a large circular disc was produced. The stage was about to change and Craig would find himself on it, in a manner of speaking. An object appeared in the middle of the cubical viewing area that was the bust of a man. Moving into his own field of vision Craig could see the red energy ball and yet it was his energy and it moved inside the pedestal or neck of the bust. He was now seeing as the energy itself, as well as the onlooker. What a strange sensation this was, it was like viewing an object from two different perspectives at the same time and it wasn’t even confusing; clarity of perception was there. The bust was transparent now except for orange lines that sketched the prominent features’ outline. Craig was seeing it from the inside and the outside all at once. This went on for quite some time and from all different perspectives. Sometimes the grid lines were apparent, sometimes just dots, and sometimes nothing but the feeling of the grid guided Craig as he moved in the energy ball around the bust and also watched himself from the top seats of the stadium. Coming into consciousness he immediately felt his finger on Suzzan’s shoulder and the thought lodged in his mind; it was as if that contact allowed him to come back to this dimension from visiting another. He was back in the hotel room now and not any closer to knowing what the mission was about, or so he thought at that time. I realize how that sounds and yet it felt as if I was one of the wooden Russian dolls that fit inside the other doll, inside the other doll etc… the incident so profoundly linked that time with my vision in the hotel room in a clarity that identified the rare glimpse as another aetheric exchange taking place. Please see below and after the graphic The Breadth–Depth–Height- Space Cube: (CHAPTER: 03: SACRED GEOMETRY IN THE QUANTUM REALM, with all associated subsections) from the website. First, we vibrate a guitar string. This creates “standing waves,” meaning waves that do not move back and forth across the string but remain stable in one place. We will see some areas where there is an extreme of vertical movement, representing the top and bottom of the wave, and other areas where there is no vertical movement, known as nodes. The nodes that are formed in any type of standing wave will always be spaced evenly apart from each other, and the speed of the vibration will determine how many nodes will appear. This means that the higher the vibration rises, the more nodes we will see. In two dimensions, we can either use an oscilloscope or vibrate a flat circular “Chladni plate” and see nodes develop that will form common geometric forms such as the square, triangle and hexagon when connected together. This work has been repeated many times by Dr. Hans Jenny, Gerald Hawkins and others. Though this is a very simple concept in terms of wave mechanics, Gerald Hawkins was the first to establish mathematically that such geometries inscribed within circles were indeed musical relationships. We may be surprised to realize that he was led to this discovery by analyzing various geometric crop formations that would appear overnight in the fields of the British countryside. This has been covered in both of our previous volumes. Figure 3.1 – The five Platonic Solids. pentagonal faces on the dodecahedron. Each shape will fit perfectly inside of a sphere, all the points touching the edges of the sphere with no overlaps. 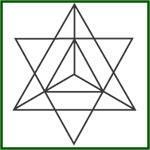 Similar to the two-dimensional cases involving the triangle, square, pentagon and hexagon inside the circle, the Platonic Solids are simply representations of waveforms in three dimensions. This point cannot be stressed strongly enough. 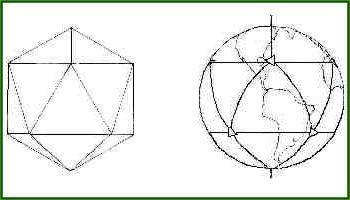 Each tip or vertex of the Platonic Solids touches the surface of a sphere in an area where the vibrations have canceled out to form a node. 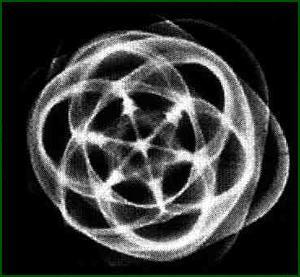 Thus, what we are seeing is a three-dimensional geometric image of vibration / pulsation. Both the students of Buckminster Fuller and his protégé Dr. Hans Jenny devised clever experiments that showed how the Platonic Solids would form within a vibrating / pulsating sphere. In the experiment conducted by Fuller’s students, a spherical balloon was dipped in dye and pulsed with “pure” sound frequencies, known as the “Diatonic” sound ratios. A small number of evenly-distanced nodes would form across the surface of the sphere, as well as thin lines that connected them to each other. 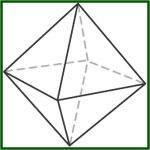 If you have four evenly spaced nodes, you will see a tetrahedron. Six evenly spaced nodes form an octahedron. Eight evenly spaced nodes form a cube. Twenty evenly spaced nodes form the dodecahedron, and twelve evenly spaced nodes form the icosahedron. The straight lines that we see on these geometric objects simply represent the stresses that are created by the “closest distance between two points” for each of the nodes as they distribute themselves across the entire surface of the sphere. Figure 3.2 – Dr. Hans Jenny’s Platonic Solid formation in spherical vibrating fluid. Dr. Hans Jenny conducted a similar experiment, a small part of which is pictured here in Figure 3.2, wherein a droplet of water contained a very fine suspension of light-colored particles, known as a “colloidal suspension.” When this roughly spherical droplet of particle-filled water was vibrated at various “Diatonic” musical frequencies, the Platonic Solids would appear inside, surrounded by elliptical curving lines that would connect their nodes together, as we see in the picture, where it is clear that there are two tetrahedrons in the central area. If the droplet were a perfect sphere instead of a flattened sphere, then the formations would be even more clearly visible. 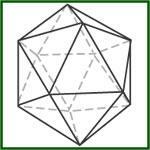 The mystery and significance of the Platonic Solids has not been completely lost to modern science, as these forms fit all the necessary criteria for creating “symmetry” in physics in many different ways. For this reason, they are often seen in theories that deal with multi-dimensionality, where many “planes” need to intersect in symmetrical ways so that they can be rotated in a number of ways and always remain in the same positions relative to each other. These multi-dimensional theories include “group theory,” also known as “gauge theory,” which consistently features various Platonic models for “infolded” hyperdimensional space. We really do have to pay attention or the simple bursts of subtle synchronicities just continue to pass us by. Okay, that may sound like a stretch to you…I know what it means to me. Just as I can see great depth in Sacred Geometry of a manmade kind, now science shows its depth on a natural microscopic world in the form of atoms and molecules and fine particles on the macroscopic world. As before, do not get hung up in all the details and explanations above in chapter 03, just see the associations and elegance of life at a level most are unaccustomed to, or aware of. Do you find it coincidental that many ancient writings and teachings relate to Platonic Solids in relationship with sound (frequencies) and manifestation in creation of matter and conscious thought? The below vision took place in Tiahuanaco (Tiwanaku) Bolivia in September 2000, holding danburite in one hand and holding Suzzan’s hand in the other while she rotated under the Gateway to the Moon performing a recital ceremony. Years after the visit we found in The Book of Knowledge: The Keys of Enoch 11 a reference (prophecy) that the original city “contains the gate threshold” and that Melchizedek would come “at the end of this cycle of time and open the Treasury of Tiahuanaco.” 12 (recounted in The True Philosophers’ Stone) The Melchizedek reference is used in the Old Testament as well and I believe it can also refer to a process or chain of events “in the Order of” as opposed to just a person. Danburite has shamanic characteristics and according to Crystalline Communion 2000 13 ”…it allows huge amounts of light energy to be passed through the subtle and physical bodies. The drafts of light can be sudden like bolts of lightening, however boron provides energetic stability to the body so it can withstand intense light pressure as it transits the physical and subtle bodies.” 14 What I now know to have taken place is a chain of events including not only the quote and my vision, but clarification of events by science that makes the whole aetheric exchange at least conceivable for sanity’s sake. Please see below: (CHAPTER 04: THE SEQUENTIAL PERSPECTIVE, with associated subsections) from the website. We have indeed seen the evidence to suggest that the atom is an aether-vortex with spherical symmetry and a central axis, thus forming a spherical torus. The Biefield-Brown effect proves that the grand solution to the mystery of “charge polarity” is that aetheric energy is flowing through the electron clouds into the nucleus. Dr. Ginzburg made a few simple and acceptable adjustments to relativity equations and produced a model that perfectly explains the behaviors of matter observed by Kozyrev in the laboratory, wherein it sheds energy and mass as it is accelerated towards the speed of light. 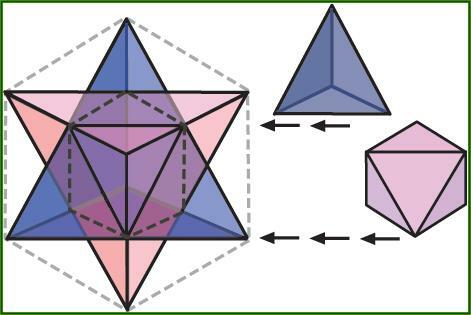 Through the conventional crystal molecule formations of the tetrahedron, cube and octahedron, and especially with the introduction of microclusters, icosahedral and dodecahedral quasi-crystals and the phenomenon of Bose-Einstein condensates, we now see the importance of Platonic Solids in the quantum realm. We can no longer deny that these forces exist, as we now have irrefutable physical evidence. These new findings also reveal that we no longer need to think of atoms as individual units, but rather as harmonic aether vortexes that can merge together into greater levels of unity and coherence, such as in quasi-crystals. And with this data in place, we now have a valid solution for all the “loose ends” of the puzzle by introducing the work of Rod Johnson. There are no “hard” particles, only groupings of energy. Every quantum measurement can be explained geometrically, as a form of structured, intersecting energy fields. Atoms are actually counter-rotating energy forms in the shape of the Platonic Solids, specifically rooted in the counter-rotation of the octahedron and tetrahedron, each vibrational / pulsational shape corresponding to a different major density of aether. All levels of density or dimensions in the entire Universe are structured from these two primary levels of aether, which are continually interacting with each other. Significantly, an increasing number of advanced theorists have already been striving towards a “particle mesh” model of physics, based on the Superstring theory, where all matter in the Universe is somehow an element of an interconnected geometric matrix. However, since conventional scientists have not yet visualized Platonic Solids that are nested within each other, sharing a common axis and capable of counter-rotating, they have missed the picture for the quantum realm. The tetrahedron and octahedron are counter-rotating within each other at the quantum level. Both have spherical symmetry around a shared center. The tetrahedron and octahedron represent two primary levels of aether density that must exist in the Universe, which we shall refer to as A1 and A2. Figure 4.2 – The octahedron (R). and its fit inside the interlaced tetrahedron (L). Figure 4.3 – The eight “phase positions” created by the counter-rotating octahedron and tetrahedron. Figure 4.4 – The eight “phase positions” as they relate to basic crystal structures formed by the elements. The tetrahedron and octahedron are both under high pressure – the tetrahedron is pushing in towards the octahedron, much as the negative electron clouds press in towards the nucleus. This pressure can only be released when either a node or line on one of the solids crosses a node or line on the other solid, opening up a gateway for the energy to flow. The easiest way to visualize such a “gateway” opening would be if you cut out a hole in a piece of cardboard, and then turned on a hair dryer and held the nozzle flat against the cardboard, then sliding it towards the hole. Until the nozzle actually reached the hole, the air has nowhere to go, and the engine will quickly run hard and overheat; but once the nozzle reaches the hole, the air has somewhere to go and the pressure is released, with the engine then relaxing. Inside the atom, via the Biefield-Brown effect, the pressure in the electron clouds is always trying to rush towards the nucleus, and unless the counter-rotating geometries connect, that pressure is blocked. In this sense, the lines and nodes in the geometric forms could be seen as the “holes” that are “popped” in the nested spherical fields, which will allow the in-streaming pressure to flow through. Sequential perspective of matter for process implementation, explains the chain of events that took place starting at Tiahuanaco with culmination much later. Consider the quote (prophecy) in association with my vision happening at the same time as the physical movement of matter continuing throughout the ceremony and one can see how the above scientific information of “Sequential Physics” could describe in theory the events that took place. Just make an attempt to see associations between the keyholes in doors, symmetry of it all, shaft of light coming down at first, then shaft of sparks raising me off the ground and me being on a ride just where I should be. Piece together Suzzan and I in the center of the lamas’ circling positions around the Moon gate, the ritualistic recital, finding out about the prophecy long after the event, and maybe aetheric exchange will happen for you right now. The lamas never made much sense to me until recently, but in the details of our book before the vision excerpt, the lamas were paired black with white and were positioned south and east, only to switch partners and end up white with white at the West and black with black at the north. Shifts to indicate circular rotation and separateness with eight phases of paring and position combinations in relation to the central gateway all make me think about unlocking my mind in terms of time and how physical matter required specific setup before energetic exchange could really take place. I unblocked, allowing “in-streaming pressure to flow through” to my conscious awareness. We were still on the South American September 2000 trip at the base of the mountaintop site of Machu Picchu Peru in the town of Aguas Calientes. We had already been to Tiahuanaco and performed the first leg of the ceremony. Suzzan and I were in our hotel room at “Gringo Bill’s” early in the morning of the day we were to perform the second part ceremony on top of the mountain. “Suzzan, are you awake?” Craig said around five in the morning. 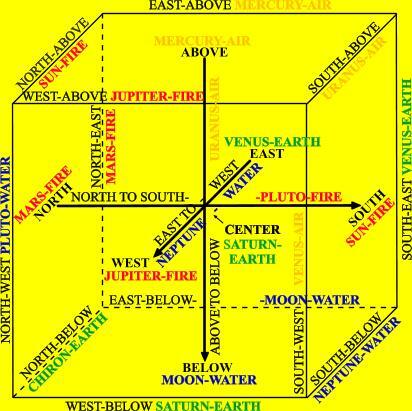 Remember Suzzan and I are situated physically at the base of the mountaintop site of Machu Picchu Peru and within the geometric grid work of the other six surrounding mountains that form a curious six-pointed star network. The vision clearly shows me a transfer of energy being brought for a power boost on the second part of the ceremony. In most if not all of the ceremonies we have been involved in, Suzzan has been the key or focal piece. I have been more like a facilitator and observer; yet we combine to complete the process. Even though the energy spoken of above was not a bright glow and visible only to me, does not detract from the similarities of phenomena I witnessed and those described in chapter 05 below. Please see below: (CHAPTER 05: LARGE-SCALE GEOMETRIC ENERGY FORMS, with associated subsections) from the website. …flickering, pulsing lights that change shape. A couple of times in the 1990s, Norwegian engineers investigated the lights. But the research became more serious this past August of 2001 when Italian astrophysicists joined Norwegian engineers in a joint study with radar, photographs, videotape and spectroscopes. The results can be broken down into two groups: 95% are thermal plasmas and 5% are unidentified solid objects. The plasmas emit long wave radio frequencies and strangely, their temperatures do not vary with change in size or brightness. The luminosity increase of the light balls is due [only] to the increase of the radiating area. But the cause, and the physical mechanism with which radiation is emitted, is currently unknown. … when we process the data we see that many small light balls vibrate around a common barycenter. So it is something like a center force that is ejecting balls or the mini-balls are going around the center body. It is quite complicated. MT: And we also saw during the processing phase that these plasmas are able to assume several shapes. Sometimes, also geometric. MT: Yes. Sometimes also geometric. We don’t know the reason about that yet, but we saw something that was like a rectangle. It suddenly changes from an amorphous plasma to a rectangle. It happened transiently and we saw it and it is in my paper, EMBLA 2001: The Optical Mission. LMH: So you were watching something round like a sphere of plasma and it suddenly transformed into a rectangle? MT: Absolutely. At first we thought it was a sort of instrumental effect due to the video camera. But after we compared the photo of this same phenomenon with the video of the same phenomenon, we saw that they were the same thing – that is, a plasma – in spite of that geometrical shape, because we can do certain analyses by studying the distribution of light, and also by taking the spectra. We see that one is a plasma. So, it is strange – a plasma phenomenon that we can describe, but not yet tell what is the main reason that is causing it. These same areas are high and low pressure systems in weather and storm centers. Spiraling gaseous nebulae have been observed from space centering in each Field. The Earth’s surface layer (lithosphere) and the physical aspects of plate tectonics (subduction zones, plate boundaries, rises, rifts, stress patterns, earthquake-wave anomalies, etc.) are related to the Fields’ locations (further discussion is in section 3.4). Patterns and changes in the upper atmosphere, radiation belts, and the magnetosphere show relationships to the Fields. Eels, iron-precipitating bacteria, and electric fishes are geographically located in these areas. More than 70 percent of all life on Earth is situated in relation to the Fields (between the 40-degree latitudes), which is ideal for the generation of electrical energy by life. …In 1972, Ivan Sanderson published an article entitled “The Twelve Devil’s Graveyards Around the World” in Saga magazine. These “Devil’s Graveyard” areas are the same as the “Fields” discussed by Pasichnyk, and they represent the points of the icosahedron on the Earth’s grid, as seen in Figure 5.6. 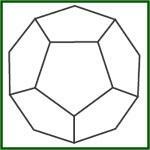 Just as a review, we know that each face of the icosahedron is a perfect equilateral triangle where every internal angle is 60 degrees. Within a sphere such as the Earth, the points of the icosahedron are located between 30 and 40 degrees latitude above and below the equator. Each point is spaced at 72-degree intervals from the neighboring points, and except for the two at the poles, their exact geometric center is at 36 degrees North or South latitude. All together, there are five points in the Northern Hemisphere, five in the Southern Hemisphere and two at the poles. The mountaintop site of Machu Picchu is within the geometric grid work of the other six surrounding mountains that form a six-pointed star network. Tiahuanaco, the first leg of the ceremony had associations with eight phases of paring positions of lamas and many other geometric references; counter-rotating energy fields if one considers the animals, Suzzan, and me. Let us think about the physical location of the mountain top site and surrounding grid dynamics and maybe individual identity gets blended together in the over all process of torsion-wave energy exchange. When we consider energy fields are diverse and present in the world, whether we are aware and work within their framework is on us as individuals. Prior to traveling to Tiahuanaco on the South American September 2000 trip we headed for the small tourist destination of Copacabana located on Lake Titicaca. It would be our base for the next couple of days to include boat rides to the Islands of the Sun and Moon. It was on the boat ride back to base camp after visiting the Islands on that beautiful lake on the top of the world (12,500 feet) that I related my visions to Suzzan. I was brought up believing that the earth as a planet and inanimate objects such a rocks and dirt, were really without life. People had life and so did animals, plants, and insects, but not in a way that was anything like the human being. That was kind of a general feeling in the 50’s and of course there were those that knew better, but they were not writing the text books, spouting scientific understanding, or part of the norm in the Midwest anyway. My visions both hover round the beauty and lifelike animation of the very things that I was taught as a child to believe were really dead. I grew to understand better than dead of these things, but science certainly has taken its time to get back around to seeing our universe in any kind of oneness with a corresponding heartbeat. Please see below: (CHAPTER 06: THE UNIVERSAL HEARTBEAT, with associated subsections) from the website for a refreshing change. Now that we have a basic working model for how matter and energy are functioning at the quantum level, as well as having demonstrated a harmonic expansion of these principles into the behavior of plasma formations and planetary energy dynamics, we are ready to propose a truly unified model of a Divine Cosmos. This model has been hidden in the ancient textbooks, monuments and mythological legends of esoteric science, now hoary with age and waiting to be re-discovered. This newly rediscovered information also allows us to consider the origin and creation of our known Universe as a blossoming, conscious Ultimate Being, instead of as a sudden explosion of “nothing” that scattered lonely, slow-burning nuclear furnaces into the paralyzing darkness of space. In almost all esoteric spiritual traditions, the Universe begins with the Oneness, which is shrouded in mystery. It is said to have the shape of a sphere, and we shall refer to this as the Universal Sphere. Or, from a mathematical perspective, we can think of this Sphere as a pure point, which has no “time” and “space” as we now think of it, thus both infinitely large and infinitely tiny, depending on your perspective from within it – and a point would indeed have spherical symmetry. Though we cannot truly speculate on its contents, its identity shows up in modern Russian physics as the “Absolute Physical Vacuum” or APV. It is quite mistakenly referred to by Terletskiy as “useless” since it has no movement within itself – and without movement, there can be no change, no time, no energy as we now think of it. A1 swirls clockwise while A2 swirls counterclockwise at the same time, and they will mostly pass right through each other in the Sphere as this movement continues. Since A1 vibrates slightly faster than A2, A1 will also rotate slightly faster than A2 in the Sphere. This shall be seen as an important point later. The bodies of A1 and A2 are fluidlike, in that they have spherical “field bubbles” that have the ability to flow around. This is supported by the work of Kozyrev, Mishin and others, who showed fluidlike activity and “currents” in the aether. However, these “field bubbles” also have inner Platonic Solid geometry that causes them to remain bonded in a relatively stable matrix formation with their neighbors. A1 bonds to itself as one spherical entity, and A2 bonds to itself as a separate spherical entity. Hence, this fluid-crystal geometric quality of A1 and A2 keeps them from blending into each other (homogenizing) all at once and losing their counter-rotating momentum. And, as they counter-rotate, their “field bubbles” can slip past each other like a superfluid, even though they are under very high compression. In a sense, this is similar to how people can pass through each other on busy city streets while walking in two opposite directions. Again, the fluid-crystal matrix qualities of A1 and A2 cause them to preserve their own inner geometric order, much like an elaborate Vedic mandala pattern, while they counter-rotate. This could be thought of as a form of inner magnetic attraction. However, if we start actually sending ripples (pulsations) through this Universal Sphere, the field bubbles of A1 and A2 will be bumping into each other, conducting the vibrations (pulsations) as a single, unified fluid. These pulsations are the actual, true definition of torsion waves. This concept of A1 and A2 as a unified fluid is extremely important in understanding how the Universe actually functions, as it explains that all levels of aether, regardless of their density, are comprised of both A1 and A2. Thus, A1 and A2 could be thought of as the precursors to the Octave of aetheric energy densities that we discuss. This will become clearer as we progress. Most of the time, A1 and A2 slip around each other as they pass. However, if their geometries are properly aligned, they can and will blend together. Electromagnetic energy is formed when the field bubbles of A1 and A2 merge together. Of course, we know that electromagnetic energy is the building block of all physical matter, according to Einstein and others. Such merging is obviously not allowed in conventional “particle” models. The two fluidlike aethers are indeed counter-rotating inside of a spherical space, continually and easily flowing past each other with qualities of a “superfluid,” meaning that unless their particles collide, there is literally zero resistance to their movement. As the two fluidlike aethers pass each other, some of their field bubbles will directly collide. When their geometric frequencies are properly aligned, the two different forms of energy of A1 and A2 merge together. Once A1 and A2 merge together, they are immediately compressed by the material that surrounds them on all sides. Similar to how a spherical bubble of air forms in water, the compression of the merged energies of A1 and A2 forms a miniature sphere. This creates a tiny replica of the Universal Sphere,a perfect microcosm of the macrocosm. Within this tiny sphere, the aetheric energies of A1 and A2 will continue to counter-rotate and swirl around each other just like they do in the Universal Sphere. This forms a vortex, which takes on a form of “gravity” by attracting A1 and A2 into itself via the Biefield-Brown effect, as explained in Chapter Two. As these tiny spheres continue to attract more and more field bubbles from A1 and A2, they will gradually grow in size. This is not much different than adding new droplets to a spherical bubble of water and watching it expand in size. The “units” that are formed in this process form matter as we now think of it, via Johnson’s model. Without A1 and A2 blending together, there is no observable matter. With all that is written above, we have now set up the most important basic properties in this “aether” model of the Cosmos. The unified model of a Divine Cosmos with a universal heartbeat lends itself to my understanding of that oneness I call God. The ancient mystery schools taught about it and called it many different names, some even refused to name it hoping to remove any doubt that we could ever comprehend the complexity of it all. The entertainer Prince did away with his name for a while and now he is back to it; maybe for the ease of conversation. I do not know his reasoning and am in no way trying to imply equal situations. Something with a name is just easier to write about. Aether 1 (A1) and aether 2 (A2) above can be easily associated with the duality we all live with. I certainly have felt an occasional “swirl in opposite directions” inside of me from time to time seemingly not affecting my Platonic Solid body geometry matrix, yet causing great disturbance to mental dynamics. As I have said before about the science…do not get hung up trying to understand all the details; just let it wash over you as fluidic aether was intended to. Only then will true energetic exchange take place in the manner intended. I feel the need to explain some things to you before you read the next few sections under the abbreviated version of CRAIG’S STRUGGLE. It was taken from The True Philosophers’ Stone where I relate my singular evolutionary process of 10 years at that time (2004). Later on below I get into the idea that two points are acting on the third point (myself), which are quite similar to aether 1 (A1) and aether 2 (A2) in theory. Craig’s Struggle was written long before I ever saw any scientific explanation like what we just read. It is of comfort for me to find confirmation in other sources of information as I move forward living the procedure. I do not feel the struggle described below any longer. I do feel acute awareness in harmony with life now, something I had lost for a while. Exercise serves many functions for Craig and in his time of necessary efficiency awareness, a healthy body seems like a no-brainer in basic correctness of action. He feels an urgency to concentrate on purpose and eliminate internal or external distractions that use his energy for any other reason. Exercise aids in the process. He found in the giving up the old that no longer promotes his mission and opening up to the new that resonates with his spiritual core, having a constant is crucial for mental and physical health. The constant of exercise allows him to: gauge and boost physical energy, start his day with checked focus, gauge level of penetrating external influences, stimulate correct mental attitude, and rid his being of toxins. Taking time out to reflect on the moment, day, or week has been very helpful and even crucial at times for Craig. Suzzan reads to him on Sundays using this relaxing day out of the week for studying but also reflecting and visualizing while combining the aid of various crystal energies into the mix. Craig is a very visual person and when she reads for him the sound couples with thought and produces visuals that bring him clarity. This clarity of visual thought is easy for him to call up at much later dates when different concepts or thoughts need to be tied together. The method of storing the thought with the visual has been very beneficial for his understanding. Some thoughts bounce around in his mind until they are tied with others. Scriptural references to the following continued to play on Craig’s mind: fullness of time, all in all, and the reversing orders of last and first. They seemed to be interconnected and relevant to now. To him, they were indicators or triggers that sparked a remembering or course of thought to be followed. The combination resonated in his core or essence and then played in his head. The spiritual references drew a vision of three-hundred-sixty-degree movement traveling clock-wise in an ever tightening downward spiral, end contact, and the lift to counter-clockwise spiral assent. …In respect to the big scheme of things, Craig looked back on his life and a vision of the serpent swallowing its tail shot through his consciousness. Not because he felt that he had any great wisdom, but because it reminded him of a process that was used to help (spirit) know self (Craig) in that necessary closed-loop examination of moving forward. The term closed-loop becomes a misnomer when another dimension (vertical/God) is added to the equation. To be more precise, it is always moving upwards and to the right as reported in The Emerald Tablets of Thoth the Atlantean 18 that best describes the process as an upward spiral. Such a process is continually moving us through the levels as well as focusing us on the purpose. This is only important if one thinks there is a necessity to move in the additional dimension or direction of God, so to speak. Wasn’t this a free will choice that he (third point) was being asked to make in this fullness of time, or upward spiral request from God? In this duality, two points exist that are each trying to gather the third (trinity), being bound by the same rules and operating in the gravity of the material world. Ascending movement requires that the third point exercise free will by constantly supplying energy for upward spiral motion. Dissent or lack of upward movement will result if that third point gives no energy to the process. If we consider for just a moment that the attracting points are growing stronger and repelling or moving away from one another, then the concept of good or bad can be removed from our free will choice. Ultimate outcome of the struggle is the complete gathering of all attractable points around either of the two attractors. Now, what is yet to be determined by constant choices is where each of the third points will end up at the point of division. …There is a plan for evolving to a state-of-existence that he could only imagine. Craig knew that the plan is a divine one involving free will and requiring continual reception of the plan data stream. To receive that data efficiently one must connect receiver with verified transmitting source and then have a way of discerning or filtering pertinent data from all other. This process, new to every one of us must be experienced and maintained through constant vigil or monitoring. Continual reception from God or the divine must be held. Not fully aware of his duality, that part of him that is Spirit was not what he knew when he thought of himself. “I” should indicate the spirit, but it indicated the brain/ego or the other half of duality, matter. Until the bridge was built between what Craig now calls, “The human brain and the spiritual brain,” he could not change the way that he thought, or repent (in the true meaning of the word repent). He did not even know self, until spirit in him was recognized. In order to actively participate in the divine plan, it must be spiritually discerned or filtered by the heart. In the heart resides the spiritual brain and through the heart the plan data stream reaches our spiritual brain and then can be fed to our human brain for processing. Unless we retrained our thought process by building that bridge from heart to brain, the plan cannot be known. Craig had to change the way he thought by exercising free will choice and keeping God’s plan fed to his human brain by way of his heart through the filtering process of spiritual brain discernment. …At one point there is a leap of faith required to follow God’s plan. This leap will involve overcoming fear and the moving from the separateness of me, to the oneness of spirit and we. Part of the reason for Suzzan and Craig’s first book MY LOST LOVE was to share their leaps with the world in the hopes that this would reduce that fear for others. Once the leap was made, Craig found that staying on the path required faith and hope getting fed by the two-way communication with God. His previous life and thought process were so different from the demands of the spiritual life that he knew a purging or cleansing must take place to even maintain an efficient communication line. A close examination of Craig, using his new perspective of the God dimension was necessary. The new bridge is built for the communication path from brain to heart to God, back to heart and then brain and is a counter-clockwise flow over the bridge first and then through the body’s plumbing. The new path is accomplished by use of that newly built bridge and the original body’s plumbing now flowing in the opposite direction. The thought of body flow reversal or change, is an important factor in realizing the need for cleansing and purifying, often mentioned in scripture of varying kinds. Consider that a screen filter in a closed pipe system always has water flowing through it in the same direction. The output of the system feeds another system that depends on clean water for proper operation. Due to impurities in the water, the screen filter will trap those impurities on one side of the screen and will pass clean water through unless clogged. Now imagine water flow through the screen filter gets reversed, and now all those impurities get washed from the filter and sent into the other system that required the clean water. This would not be good for the system that got passed the dirty water, and operation of that system would suffer. …The honest knowing of the ego in Craig’s duality was the benchmark or foundation that provided the necessary perception of the unknown, and strength required to be led through it. It is like he is floating in space with one arm wrapped around a pole and standing on a small circle of familiar ground. His other arm is outstretched in gathering up the cosmic breadcrumbs of truth. This works for a while until that one free hand fills up and suddenly he is faced with a decision. Pausing to eat the gathered crumbs, he soon realizes that in this course of action, some crumbs are moving by uncollected. He releases his hold on the pole and leaps from the ground head first after the crumbs with mouth wide open. What a relief; a strange force moves him in pursuit of the trail. For a while everything is fine until the source of that trail leads back around into his very mouth. But wait, things have changed and he has become that unknown observer that is swallowing self or the ego that was the only part really known in the duality of Craig. He can feel that familiar part of him dissolving yet taking a path that leads straight to his heart-gate and into the way of inner space, the kingdom of God. The illusion of truth and God residing somewhere out there had finally been shattered with the eating up of self. No more crumbs to follow. No more worries of terra firma or hanging on to useless cores that actually create the struggle. What a release to finally push off and let the flow take him. To find the flow moved him right to his heart over some kind of newly constructed causeway and on to the infinity of inner space. No wonder Eastern thought refers to illusion and the need to recognize it. Craig always thought of illusion as something that affected clarity of our every day life, not the very ground that we walk on and that which encompasses the entirety of existence in life through our five senses. That was the end of the CRAIG’S STRUGGLE section and I have another piece for you that was taken from a fictional book based on a true story that we have not published as of yet. In the book Linda is a dual-dimensional being having a human body (microcosmic) and a spiritual connect (macrocosmic) that operates as heart and portal for the now present Christ-Conciseness of the macrocosmic body. It was included because after reading everything else, maybe you can appreciate the possibility and beauty of an operational Godnet. Let me paint the rest of the picture and explain how individuals tie into the Body, and so called God-network, through their individual heart-gates. The interface circuit that Linda represents on the macrocosmic level uses her as a resonant chamber for the heart of the Body, tuned to frequency of God’s love. All of the rest of us on a microcosmic level have our hearts’ resonant chamber operating at the same frequency that is also God’s love. All of our hearts contain a heart-gate that is only operational when the individual is of a certain vibration and opens to inner-space or The Kingdom of God. With the heart-gate opened, we receive Gods carrier signal and two-way communication with God becomes possible. The operation is much the same as television or more precisely two-way radio communication. Let me emphasize that the vibration energy or frequency makeup of the individual must be correct for the heart-gate to function; fear, anger, or doubt set our energy to the wrong vibration and the gate will not operate. Let me get to our microcosmic hookup with the God-network, and ultimately to the Body, should anyone so desire. It is no coincidence that the heart has two chambers or ventricles, which handle input and output flow. As I said, I see Linda as a resonant chamber. A resonant chamber is nothing more than a physical chamber cut to a particular wavelength and measurable in length, height, and breadth resonating or vibrating to a single frequency. So if you consider that God’s carrier frequency of love moving through inner-space is the frequency that all our hearts are shaped for, then a God-internet isn’t such a stretch. It seems brilliant to me. It is only accessible through each heart-gate yet, can touch any right-frequency operating individual at any time in any place with impenetrable wireless security and no installation required. We just have to be vibrating at Gods love to operate the heart-gate and establish two-way communication. The operation of the macrocosmic Body uses the similar operation and manages to shower this non-kingdom plane with Gods love at such intensity that it affects all matter or vibrating energy. This is done to such a degree that all surrounding matter is changed to the same vibration as God’s love and able to pass through the macrocosmic Body’s heart into inner-space or the Kingdom. Communication through our heart-gate to inner space and God is more than a belief; it is a reality that can be experienced constantly. Our “aether” model of the Cosmos acting in oneness with a universal heartbeat as scientifically explained and coupled with our inner knowing, makes the Godnet not only possible, but also plausible. It is vital to pay constant attention to the steering subtleties used to guide me along the aetheric stream of consciousness made available to me only through intended continuous effort. I make mistakes when attention drifts off signal reception using my manual override circuit; each day now it’s dismantling approaches competition. Data volume and sources are building around us at an exponential rate providing much evidence of past misconceptions or deceptions that masqueraded as truth for too many years now. Just as the academic world is regurgitating long digested understanding as “consciousness science” now, physical matter is giving up secrets from the bowels of the earth in archeological findings such as The Nag Hammadi Library (1945) and The Dead Sea Scrolls (1947); still coming into only partial public view. It is important not to block aetheric flow with a data-restriction suicide attempt triggered by ego using past conceptions formed about pertinent areas of interest… stay open. God does not break down doors; areas of thought must be open and accessible for input. Reincarnation must be understood in order to remove our fear of loss of life. Fear produces catastrophic failure to the heart-gate and stops our flow of God-data, which makes it impossible to follow the plan needed for us to evolve. Maybe not your choice of scenario, but it is the only one that is playing. We are all caught up in it like it or not. Look at the overwhelming evidence around you. Even our very planet is giving us signs. We have aetheric help available to us. Look for the correlation between scientific and religious writings at this fullness of time. The Bible has been around a long time for a good reason. There is vital information in it that is crucial for our evolutionary journey. Jesus of the Bible was the first completely successful example of an energy worker and that is why he was associated to the cross. The 90-degree intersection is where maximum exchange of many forms of energy takes place; in this case that form was spirit and matter in perfect balance and juncture needed for transformation to occur. 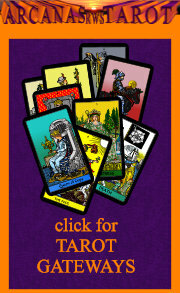 We can use the information to understand what aetheric energy exchange is available to us now. It never has been about man being correct; it has been about the ability to follow the plan. Man had not evolved enough in body or spirit before Jesus and so it was not possible until then. Man will not achieve success of evolution by devising a plan, only by following the one in place. Religion and science can be seen as ways to connect with our surroundings. Carl Jung the founder of analytical psychology whose contributions include his concept of psychological archetypes, collective unconscious, and use of synchronicity successfully used religion and science in his field of study for the benefit of mankind. An archetype can be described as an idealized model of an object or concept from which similar instances are derived, copied, or emulated. By utilizing Jungian understanding and recognizing “90-degree intersection” concept tracking of archetypal platonic solids made up of aetheric energy, the synchronistic guidance process becomes possible and plausible in heart-gate connection with the plan. Tracking the archetypal is made possible through faith; faith allows us ability to receive or color within the lines so to speak. Understanding concepts may require the use of both religion and science when the idea lands in the gray area between; no matter which one of them/both you use, you can connect to what I am telling you. Maybe you do not agree, but the message is understandable. In our brief history we can see how the two have moved together and apart over the course of recorded time. Organized religion is being replaced with spiritualized understanding and coming back into alignment with science; where it was in times before. The following bullets show you examples of the evolution of guided energy workers following what they believed to be the plan. Please remember that with the scientific model describe above there is and A1 and A2, each have a polarity in opposition to the other, yet they exist together to provide needed evolutionary results. It is a process that gets ready for a specific time. 1994 Jerusalem - Christ Energy reenters this plane (1st part of the 2nd coming) through Suzzan’s heart vortex. 1999 Cusco Peru – Dali Lama confirms Energy has moved out of East to South America (West). 2000 North America - Energy move to North West area for focusing and forming vortex. For many people the information in the Bible and the recounting of Jesus hold no relevance to evolution but in order to understand the scripture and the relevance, other ancient writings must be consulted along with understanding of symbols. The symbol of the cross, the crucifixion instrument, or the two intersecting lines is of great iconic or symbolic meaning. 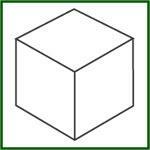 The cube is one of the Platonic Solids, above it was called “The Breadth–Depth–Height Space Cube. Take a look at how it unfolds with its 6-faces to take the shape of the cross. The information for understanding in this time is available; we just have to fix our intent on finding it. We do not have to look very far. True information resonates in our heart. So many things that were just a belief for me became a realization. I have moved past my life to the very fabric of life. I feel the call moving me past the insanity in forward rhythmic step with the aetheric tune of love pulsing in my heart for the dance of life in the evolution of transformation. I am not alone. David Wilcock’s website as I have referred to before helped put a comforting scientific perspective on the numerous abnormal events introduced to me in life out of the box. I want to thank him for his efforts and generous nature in granting me permission for use of that site's data. Please take the time to visit his site: http://www.divinecosmos.com/. THE ENERGETIC TRANSFORMATION OF OUR ENTIRE SOLAR SYSTEM is now underway, and we are already feeling the effects -- which the US Environmental Protection Agency admitted in a front-page New York Times article in 2002, (which Bush later dubbed "an act of the bureaucracy") but is attempting to blame on global warming. This is by far the most facile and under-informed opinion about what is going on, though human pollution is certainly causing considerable damage to the Earth's biosphere. In this book, we go miles beyond either of our previous two books in the Convergence series The Shift of the Ages and The Science of Oneness. If you liked these books, just wait. When we wrote these books, we had not yet discovered the entirely new world of Russian physics, and once we found it, ALL the pieces fit together. We now present a completely Unified model, showing how the same energetic fields are at work on all levels of size, from the quantum to intergalactic. This proves that the Universe is holographic and / or fractal in its very nature. This model has never existed in such a complete form in any of our recent history, at least overtly. Many annoying paradoxes of science have now been resolved into one single, stable multi-dimensional cosmology -- which has dazzling implications for our immediate future. The information contained within this book has waited long enough. It keeps banging on the door, because it wants a hot meal and a warm place to sleep in your mind. 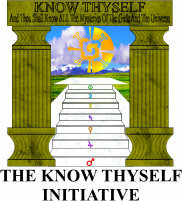 Start learning what a part of you already know come and discover The Divine Cosmos. OUR FINEST RESEARCH EFFORT YET! Since websites do change I am supplying you with the address to each chapter to The Divine Cosmos and at the end of each chapter on the site you will find links.